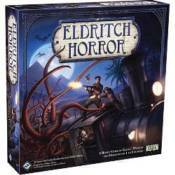 Eldritch Horror is a cooperative game of terror and adventure in which one to eight players take the roles of globetrotting investigators working to solve mysteries, gather clues, and protect the world from an Ancient One - an elder being bent on ultimate destruction. Each Ancient One comes with its own unique decks of Mystery and Research cards, which draw players deeper into the lore surrounding these loathsome creatures. Twelve investigators, two-hundred fifty tokens, and over three-hundred cards ensure that Eldritch Horror presents an epic, world-spanning adventure each and every game!